Known initially as "palliative care," the modern hospice movement began in the 1970s. Over time it has sought to provide end-of-life care in the home or a specially designated unit with a special focus on the patient's physical, psychological, social, and spiritual needs. The movement has also sought to provide inpatient care for acute symptom management and family respite. With the advent of the palliative-medicine movement in the last decade of the twentieth century, the meanings of terms palliative medicine and palliative care expanded to refer to care provided in secondary- and tertiary-care facilities from the onset of symptoms. Hospice and palliative-care programs provide their services in a cultural and canonic context that influences where care is given and by whom. For example, in Poland, the cultural tradition of keeping persons in the home, with family and friends gathering around the bed at the time of death, influenced the type of services provided. Given the poor housing conditions of the area that make caring "for the terminally ill at home very difficult," Hospicium attempted to meet those needs by being a home where relatives and friends could volunteer to care for the dying person (Tenner 1997, p. 159). Similar problems prevail in Russia and Japan, where the tight living quarters of most inhabitants make it difficult to care for terminally ill persons in the home. Such living conditions promote inpatient hospice programs. The first hospice in Russia was opened in September 1990 in Lachta, a village close to St. Petersburg. The size of the living quarters does not always determine the locus of care. In Saudi Arabia the terminally ill are cared for in the home, with support provided by the King Faisal Specialist Hospital and Research Centre. The Malath Foundation for Humanistic Care in Jordan also provides professional and volunteer support for the family caregivers, although nonprofessional volunteers outside the family help by running errands. In such situations the family decides on a direct caregiver within the family. In China, when all adult family members are employed outside the home, there is no one to care for the terminally ill; therefore, out-of-home care becomes necessary. Beijing Song Tang Hospice, an inpatient facility in China, has a nursing assistant's bed in the room with the patient in order to attend to a patient's needs twenty-four hours per day. The program survives on charitable contributions and the periodic assistance of foreigners who come to China to help provide care. As in China, the availability of caregivers in the home in India dictates the form of hospice care. In 1999, Karunashraya Hospice, a fifty-five-bed free-standing hospice in Bangalore, was opened. Marie Coughlan states, "The ability to care for sick family members is compromised because there are often no family members at home to do the caring. In the poor families anyone who can work does so; thus, even when family members are together they may all be out working" (2000, p. 1). The staff consists of four registered nurses and seven nurses' aides, a retired volunteer physician, a consultant anesthetist, and a home care team of two nurses and one family counselor. The home care team sees three to five patients each day throughout the Bangalore metropolitan area. The first hospice program in India, Shanti Avedna Ashram, was opened in 1986 in Mumbai. Since then, hospice programs have been established in Goa and Delhi. In 1995 Chennai opened a hospice program that provides limited community outreach. Access to morphine has been assured by collaboration with medical colleagues. Human resources influence access to care as profoundly as economics. In countries like the Netherlands that have universal insurance, the individual's ability to pay is not an issue. This is not the case in countries like Ghana, where the ability to pay for care as well as medications determines access. Motivation to pay for care is also an issue. Professionals in Ghana are concerned that if families think there is no cure, they won't pay for care. For this reason, and to protect the patient from hurtful news, many Ghanaians do not know either their diagnosis or prognosis. In an environment in which truth-telling is not a value, it becomes difficult to obtain referrals of informed patients. Furthermore, if care without cure is not valued or affordable, this economic reality may dictate both access and provision of services. Given these realities, sub-Saharan Africa has developed some unique approaches to meeting the needs of the terminally ill.
Sub-Saharan Africa is beset with three epidemics: HIV/AIDS, malaria, and tuberculosis. The need for hospice and palliative care for individuals who are terminally ill with these diseases should not be understood as an alternative to treatment. Appropriate interventions to prevent the occurrence of these diseases or the onset of secondary or tertiary sequellae are also required. 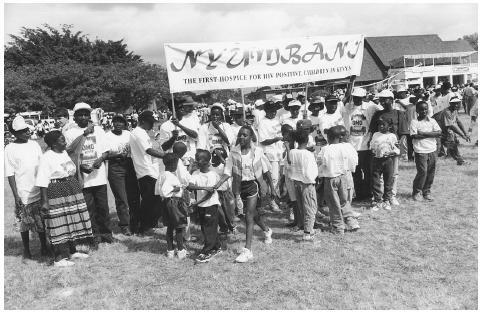 Kenyans show support for the Nyumbani Hospice that will serve HIV positive children. The first hospice in Africa, Island Hospice and Bereavement Service in Harare, Zimbabwe, was organized in 1979. As of 2001 it has fifteen branches throughout Zimbabwe. Originally organized with a home hospice nurse or social worker providing direct care via home visits, the facility was too limited to meet the needs of the increasing numbers of persons with HIV/AIDS who required care. Consequently a model of hospice as facilitator was developed. In this model, hospice develops partnerships with other organizations and with the community to provide care. Rather than providing home visiting, the hospice facilitates the care given by volunteers. Mabvuku/Tafara Hospice in Harare provides care through its trained volunteers, who render about 80 percent of the care. The hospice team consists of the health department, social services, churches, schools, police, and two hospice nurses. These two nurses facilitate the care given by the volunteers as well as seeing a limited number of patients. These programs have moved from direct provision of care by professionals to facilitation of care by volunteers as a primary mode of care delivery. This approach is a creative solution to the challenge of the AIDS pandemic in Africa. Yet even this approach may be inadequate given the numbers of individuals infected with HIV and the paucity of resources in many of the nations of sub-Saharan Africa. Resources of space and available caregivers, as noted, affect care in Japan, China, and India. Most of the hospice care available in Japan is inpatient with little support for those who wish to die at home. The lack of space in most Japanese apartments makes it difficult to provide care at home. Korea also faces resource challenges. There, hospice care is provided in both inpatient facilities and at home. Nonetheless, there is a lack of understanding of the nature of hospice/palliative care by citizens and physicians, a lack of insurance coverage, and a lack of availability of short-acting morphine. Germany has several hospice/palliative care programs headed by physicians that focus on the physical, psychological, social, and spiritual aspects of care. Largely inpatient programs, these services include a range of complementary/alternative therapies along with traditional medical care. Hospice care in Germany, however, is not a widespread phenomenon. The hospice movement began in Israel in the early 1980s with the Tel-Hashomer Hospice, which opened in 1983 in Tel-Aviv. This program was based on the British model of hospice care. The first hospice home care program was established in 1984 in Tivon. In 1986 a fourteen-bed unit was created at the Hadassah University Hospital at Mount Scopus, Jerusalem. Clinica Familia, in Chile, a hospice-hospital, contains forty beds and an outpatient clinic as well as a chapel, mortuary room, and a pharmacy. The Clinic is run largely by volunteers, including physicians, psychologists, nurses, assistant nurses, volunteers who provide administrative support, and four paid employees. The key distinctions in hospice programs worldwide are the role of volunteers as either the predominant caregivers or as supports for professionals; the level of governmental and/or private support; the amount of home space and availability of family members for home care; and the availability of morphine and other drugs. Even more fundamental is the level of information provided to patient and families about diagnosis and prognosis. Gray, Alan J., A. Ezzart, and A. Boyar. "Palliative Care for the Terminally Ill in Saudi Arabia." In Dame Cicely Saunders and Robert Kastenbaum eds., Hospice Care on the International Scene. New York: Springer, 1997. Hospice Association. "South Africa." In Betty R. Ferrell and Nessa Coyle eds., Textbook of Palliative Nursing. New York: Oxford University Press, 2001. Lee, So Woo, Eun Ok Lee, H. S. Ahn, D. S. Heo, D. S. Kim, H. S. Kim, and H. J. Lee. "Development in the National Hospice Care Service in Korea." Korean Nurse 36, no. 3 (1997):49–69. Saunders, Dame Cicely, and Robert Kastenbaum, eds. Hospice on the International Scene. New York: Springer, 1997. Tenner, Jamina Jujawska. "The Beginnings of Hospice Care under Communist Regime: The Cracow Experience." In Dame Cicely Saunders and Robert Kastenbaum eds., Hospice Care on the International Scene. New York: Springer, 1997. Coughlan, Marie. "Karunashraya Hospice in India." In the International Association for Hospice and Palliative Care [web site]. Available from www.hospicecare.com/reports.htm#anchor97165 .